Hi guys, If you need to compress your .mts files to a smaller size more suitable for a slower internet connection upload you can use a free program called Handbrake to convert these .mts files into compressed .mp4 files. Moreover, to convert the MTS to MP4 freely, another free MTS/M2TS converter for Mac is also introduced in this following article. As a free Mac Converter, Handbrake enables you to convert your MTS or M2TS camcorder videos to MP4 or MKV (only two output options provided.) It’s a piece of cake to convert MTS or M2TS with Handbrake, of course. But it’s a bit complicated to set the video settings. And Handbrake has already preset some output video formats for iPhone, iPod, Apple TV and more which you can choose when it’s needed. More, as usual as others, with several steps, you can easily finish the MTS/M2TS transcoding. Part 2.Free MTS/M2TS Converter for Mac---No paid for converting MTS to MP4! 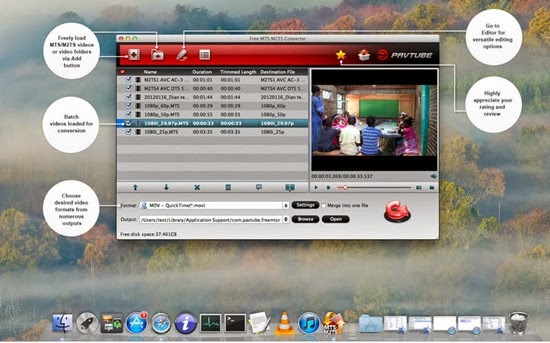 This is a Mac AVCHD Converter from Pavtube Studio that works for Canon, Sony, Panasonic and JVC cameras. It's specific on converting AVCHD/MTS/M2TS files to various video formats in sync and encoding them with preferred video codec for NLE programs on Mac, such as Final Cut Pro, iMovie, Avid Media Composer, etc. It's also a smart assistant to well sync your footage to portable devices for playing back on Apple iOS devices like iPad Air, iPad Mini 2, iPhone. To compress MTS to MP4 as the common ones, there are enough output items for your choices. Install and launch this free MTS to MP4 converter on Mac, open the main interface and you could click the ‘Add files’ to load your files in. Directly drag the files in is also available. 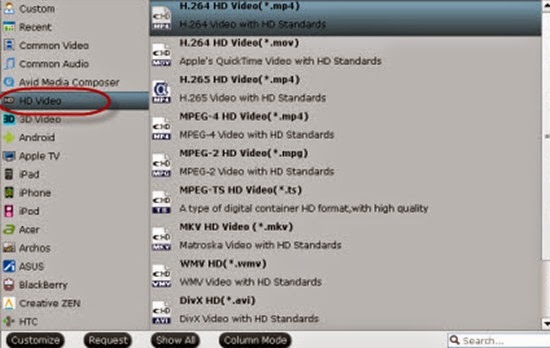 Then go to the output list after hitting the ‘Format’ bar, here if you wanna MP4 to be the output one, just select the ‘H.264 HD Video(*.mp4)’ on the ‘HD Video’ column. Or for others, we just need to drop down the list and find it easily. Tap the formats in the searching box is also a good idea. Custom video and audio settings (optional)? Generally speaking, the default settings will ensure you a good balance between file size and image quality. But you can still click ‘Settings’ button to modify video and audio settings like codec, resolution, bit rate, frame rate, sample rate, and audio channels in your own way. Go back to the main interface, the big red icon ‘Convert’ is waiting for your choice! With this easy to use MTS to MP4 converter for Mac, are you still confused with the questions of MTS workflow? Freely compress your MTS files, freely enjoy your MTS videos! Notes: Since this is a free MTS/M2TS converter for our users, it still cannot support some other latest high definition video codec. In this way, we highly recommend you the updated version Pavtube MTS/M2TS converter for Mac. With this new version, even for the latest H.265/HEVC codec, it can also support for encoding and decoding, is that cool? Just update is for a nice try!